The new Sony Cyber-shot RX10 III pairs its 24-600mm ZEISS® Vario-Sonnar T* lens with a body that record 4K and incredible super slow-motion video. In 4K video mode the RX10 III utilizes full pixel readout without pixel binning. The camera is actually capturing about 1.7x more image information than the 4K output requires which enables it to enhance image detail and eliminate artifacts. The camera uses the XAVC S codec which records up to 100 Mbps in 4K and up to 50 Mbps in HD. There’s a much-requested external mic jack and a jack for headphones as well. You can record super slow-motion footage at 1/40th normal speed with the RX10 III with stunning clarity. 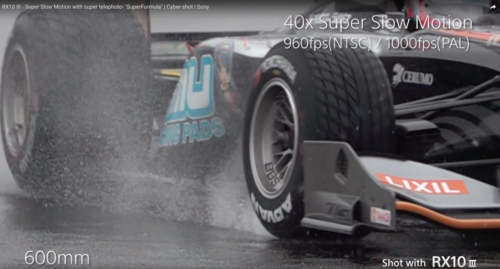 Check out the videos below to see the kind of detail the camera captures at 960fps, 480fps and 240fps. Playback formats include 60p, 30p and 24p. The camera is capturing the slow-motion footage without resorting to interpolation making the RX10 III a super slow-motion super-camera.